Gerald Anderson returns to primetime via ABS-CBN's family drama Budoy. Backed by a powerhouse cast, Budoy will feature a one-of-kind story and is certainly the first in all of the teleseryes aired in all networks. 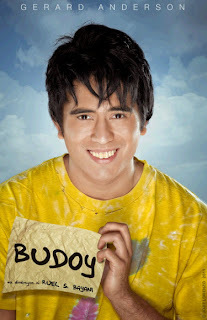 Budoy will air its pilot episode on Monday, October 10, 2011. Kapuso TV host-actress marks her comeback to the Kapamilya Network through this series. Janice De Belen will portray Budoy's mom. Also part of the cast are young stars Jessy Mendiola and Enrique Gil, legendary movie stars Dante Rivero, Gloria Sevilla and Barbara Perez, and seasoned actors Tirso Cruz III, Zsa Zsa Padilla, Mylene Dizon and Christian Vasquez. Budoy is under the direction of Ruel S. Bayani and Tots Sanchez-Mariscal.